Are you ready for the your new favorite Cozy Chicken Soup recipe?? The spice, the lime and the garlic make the chicken and beans so incredibly flavorful. I mean, it is really so good that I could eat a gallon of this stuff! I know you are going to love it too, and it will be just the thing as we head into hibernation weather! In a large pot, heat the olive oil over medium high heat and then add the onions, garlic and jalapeno. Sprinkle with salt and saute 5 to 7 minutes until soft and tender and only lightly browned. Add the whole chicken to the pot. Add the chicken broth to the pot and put a lid in the pot. Turn the heat to low and let simmer for 60 minutes. Remove the chicken from the pot and transfer it to a large bowl or pan. Transfer the broth with the onions, garlic and jalapeno to the jar of a blender (you may have to do this in batches) and puree on high until smooth. Pour the broth back into the pot and add the fresh lime juice and the beans. Remove all of the chicken meat from the bones and skin of the chicken. Shred the meat and add it to the soup. Stir everything together and season to taste with kosher salt. 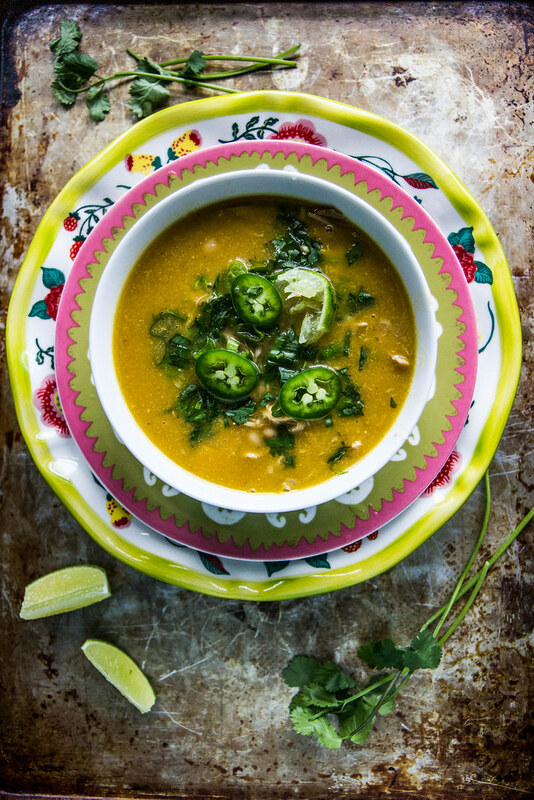 Bring the soup to a simmer and serve hot with some fresh jalapeno slices, a sprinkle of fresh cilantro and a lime wedge. So sad I missed the fun weekend (it’s a long story, but I had to jump in help with my younger sister as my parents had to go to China for a competition with my younger brother), but happy you had a good time! BUT UM, crazy day for you. UGH. Hope everyone is resting up and recovering. The soup sounds amazing!! I heard from the PR team Tieghan- So sad to have missed meeting you, but you are an awesome sister and congrats to your brother!!! This soup sounds amazing! I’m so sorry you had such a crazy day yesterday. Hopefully everything is back to normal. lol! its par for the course any time I leave town! thank you on the soup Bri!! This is gorgeous Heather!! Bring on the spice!! I was following along with you on instagram!! This is the perfect soup to warm up from Chicago’s chill! Instructions Step 2 does not make sense. If you remove the chicken and place the broth in a blender in batches, why do you put the broth back in the pot and do nothing? From the way it is written, you are removing the broth from the pot and just putting it back in the pot without doing anything. “Instructions Step 2 – Remove the chicken from the pot and transfer it to a large bowl or pan. Transfer the broth with the onions, garlic and jalapeno to the jar of a blender (you may have to do this in batches). Pour the broth back into the pot and add the fresh lime juice and the beans”. Thank you E. I fixed it. I meant that you PUREE the broth in the blender until smooth (please see amended instructions). Wish I had a bowl of this yumminess now! Happy Nesting. MAMA YEAH. Soup is a year round thing for me. I’m getting all in this super soon. SOUPER soon. Just made this. Very good indeed. I added a chicken bullion cube too. The lime adds amazing flavor. Next time, I might add some ginger too. I just tried making this soup, but 45 minutes was not enough time to cook at whole chicken on the stove … I looked up other recipes after I realized it was undercooked and other recipes say at least 60-80 minutes. aggh, Did I misunderstand directions? What size chicken did you use? Hoping to salvage, but not sure from a food safety perspective b/c I let chicken cool somewhat so I could shred. Now just put back into pot w/ pureed broth and beans to try and cook longer. 🙁 So bummed, but good lesson. Hi Ashleigh- so sorry! I must have had a small chicken. Also, it;s totally fine if the chicken was under cooked when you shredded it- just put it back in the pot and bring everything up to a simmer until the chicken is cooked through- it should be quickly after it is shredded because the pieces are so small. No problem at all- just cook it till done and it will be great. Per your feedback I changed the cooking time to help others. Thank you so much. It might be helpful to give an estimate for the size of chicken used in this recipe to give a more accurate cook time. I’ve been cooking mine for the last 1.5 hours and it’s still basically raw. Mine was around 3 lbs. I’m sure it will be yummy, but I wasn’t necessarily prepared for this long of a wait. Wonderful recipe and cannot wait to try it out tomorrow! Just made it and it’s frickin delicious! I added way more jalapeño cuz we like it spicy ! Next time I’m going to add mushrooms. Also I only had kidney beans instead of white beans and it was still great. Thank you!!! Great recipe — it is so simple and has amazing flavor for a soup that only takes an hour! Thank you. This looks AMAZING!!! Making it tonight! I only cook for two but like throwing things in the freezer occasionally when appropriate so i can grab some favorites quickly in a pinch. What do you think of the freezability of this recipe? Either way– get in ma belly!!!!!!!!! The recipe sounds delicious! But I want to clarify a few things about the the cooking time on your chicken and oil. Within your directions you said that you cooked the chicken for 60 mins but in the summary you put 45min which is the correct time? Also in your ingredients list you said vegetable oil but in the instructions you said olive oil which did you use or does it matter for the flavor since it’s a little amount? Thanks can’t wait to try it. Hi! so, in the summary that is TOTAL cooking time (including sautéing, etc.) so cook the chicken for 45 minutes. oh- sorry on the oil- either is fine. I would probably use vegetable oil in this recipe, but if you have olive oil on hand- that is great too! Thanks Ashley- i will fix! Great recipe! I made it and everyone loved it. But I found that I need to use about 4 limes to really get the flavor instead of just one. Also added citrus seasoning, diced potatoes, carrots and celery! TOO MUCH OIL! you don’t need that much my soup was almost done and I just needed to taste and i got a mouth full of oil! I was able to save it and it came out amazing but 3 tablespoons? you just need one if your just sauté. The cooking time on the chicken could be due to a couple of issues. The recipe doesn’t tell to bring the stock to a boil and then lower to a simmer people who don’t cook a lot probably wouldn’t know to do that. Also, how heavy a pot you use could be the reason for the lower cook time; I suspect you did this in a dutch oven, but maybe your readers were using a thinner less conductive pot. This looks amazing! My husband is feeling a little under the weather and I think this will help kick up his immune system. What would you say to adding a little ginger in here? Thank you! This was great! Found the blog through this recipe I found on pinterest. I substituted leftover frozen Christmas turkey for the chicken, added quinoa, and left it chunky. Oh, and extra lime and garlic because why not. We loved this… we used chicken thighs instead of whole chicken and that was great and easier than having to take the meat off the bone. I also added one can of corn and that was wonderful. We put a little mexican cheese on each bowl.. My husband sad it was one of the best soups we’ve made. I made this soup tonight and loved it.I made a few changes because I didn’t have everything. I used 2 boneless chicken breasts. And I also changed the beans to butter beans. I couldn’t find my submerger blender to I left the blending out. 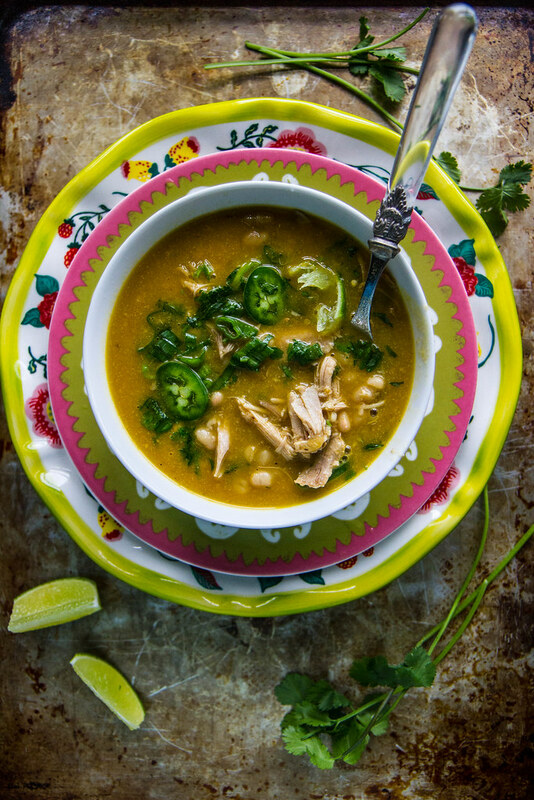 Upon serving the soup I cubed the chicken, threw that in, and spring onions as well as the lime and cilantro. This soup was delicious! My husband especially loved the green onions. Thank you for the great recipe. I stumbled upon this recipe looking for a spicy, brothy soup to make. Let me tell you, this one knocked my socks off! I make a lot of soup and have created my own recipes so I did make a couple of modifications. One ingredient I love is corn so I did add that. The only other changes were adding additional spices: cumin, cayenne, chili powder, mexican oregano and a couple of bay leaves. My husband is not fond of soup and had two bowls, one after the other! This is a keeper in our house! Thank you! Hi I have been making this soup for the last year and I figured it was about dang time I left a comment letting you know how much my family and I LOVE this recipe. My husband and I are vegans so we had to tweak a bit but still fantastic. My mother and sisters all have this pinned and use it regularly ( they are not vegans and prepare it as listed above). Thanks for the new family tradition!! Thank you so much Serena- that is incredibly nice! What size chicken do you use? A standard 3-4 pound chicken is great Rene- there is definitely flexibility in this. Loved this soup! Very tastey. I made it according to directions with one exception… I bought a whole roasted chicken from costco. I removed all of the meat and put the chicken bones in the broth veggie mixture. I let that simmer for 20 mins then removed the bones, pureed broth, then added beans and shredded chicken. I do have one question and something I might try next. Why bother to puree hot broth in batches when you could just puree the sauteed veggies with a little room tempertaure broth and add it back into the pot? Idk maybe I’m a lazy cook but I’m always trying to think of ways to make things easier, but still delicious! Delicious! I had just picked up some freshly roasted Hatch chiles, so added one of them to the mix for more yummy flavor. This soup was delicious!! I literally made it as soon as I saw the recipe. I added fresh corn and served with a little sprinkle of cheddar cheese. Yum! Thank you to the reader who added cayenne, chili powder, Mexican oregano and cumin! That saved this recipe as it was very bland before adding the above. It didn’t take long to cook the chicken after coming to a boil which is missing in the instructions ….about 90 min with a 5 lb chicken. I added the zest of the lime along with the juice of one large lime and also took the advice of another commenter and added a can of drained Rotel tomatoes. I would have added corn, but didn’t have any. Sliced jalapeños, green onions, cilantro, cheese and fresh lime are all the finishing ingredients you need. Relatively easy soup to make as I used my immersion blender in the pot vs transferring the liquid to a blender. Do make sure you check for any bones or other remnants of the chicken before blending! I just watched the video and it’s awesome! I love your lime coordinated sweater too 🙂 Makes me want the soup and the sweater! Yumm! Hearty and spicy, my kinda food! I love all of the flavors in this! Such a great soup for any day of the week! Olive Oil (video) or Vegetable Oil (recipe)?? Thanks Rick- It doesn’t matter, but I prefer olive oil- I will go fix that typo! This soup is delicious AND super simple! Full disclosure, I used 2 large organic chicken breast with organic vegetable broth and a shorter simmer time. I had all the ingredients except the whole chicken so I improvised. It’s very flavorful and I imagine another level of deliciousness with the whole bird. I added 2 large jalapeños with seeds removed, most of ribs removed and it’s very mild on the heat level. Will be making this on repeat. Thanks Heather! I made this today and it was fabulous! I added extra lime and a habanero since we love the spice element in all food. It was served during a football game and my 2 raucous football fans went back for third servings. Thank you Heather! I’m putting this into my soup rotation! WOW! Fantastic soup for the flu season. I made it 2 weeks ago and I’m making it again today. Thanks for sharing this delicious and easy recipe. I made this soup for dinner tonight. I followed the recipe to a “T” except I also added a can of corn to it. It is DELICIOUS!! Spicy, nice broth, very good. Thank you!! Looks yummy. Do you have a recommendation for making this either in the slow cooker or instantpot? This chicken soup is amazing! So much flavor yet it’s simple. Perhaps this isn’t in line with staying allergen-free, but would you ever try using a rotisserie chicken? I made this soup and it was delicious! I only altered it by adding 8 oz. fresh mushrooms, well, just because! Blenderizing the broth makes all the difference! Next time I will cut up my chicken into smaller bitesized pieces instead of shredding it into larger ones to make it easier to eat. I was concerned about the whole jalapeño making it too hot but it was just right! Great recipe! Thx!